Copyright © 2011 by Epinoisis Software . All Rights Reserved. Congratulations on your purchase of Digital Ear ! You have in your hands an advanced piece of musical software. 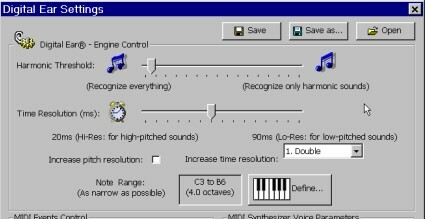 Digital Ear can accurately recognize the pitch of a variety of real world sounds and instruments and convert it into MIDI events that can be sent to any synthesizer. And pitch recognition is only the beginning because Digital Earcan send complex volume envelope and harmonic content events to your MIDI synthesizer, achieving extreme levels of realism and musical expression. Think of Digital Ear as your ultimate MIDI controller. Click on the Start! icon in. Choose an Audio file (wav, mp3 etc.) from the dialog box that appears. Let Wizard find the optimal settings for you. When Digital Ear finishes the conversion, choose a filename for your MIDI file and then click on save. Notice that the integrated MIDI file player is now activated. You can hear your MIDI file just by clicking the play button. Well done! That is all you have to do to convert your wave file to MIDI. In order to take advantage of all the powerful features of Digital Ear we strongly recommend you to read the entire manual. We have tried to keep it as small as possible. It is also a good idea to print it and use it for future reference. Activate the settings dialog box. Do this by either clicking on the Settings icon in the toolbar or by selecting the menu item Settings > Customize. At any time you can change the settings and process your wave file again by clicking on the Start! icon. Use the Apply Now! button to automatically apply any changes you made. OK button will not apply any changes until the next time you track (by pressing Start!) or save your file. An easy way to customize Digital Ear engine is by using the Settings Wizard. Click HERE to find out more about this feature. Natural sounds frequently produce non-harmonic (noise-like) sounds. That usually happens in the attack of a note (for example a consonant when singing, or the fret, bow, valve noise of an instrument). Digital Ear’s internal engine is intelligent, and can successfully discriminate between harmonic and non-harmonic sounds. In order to accomplish that, you must carefully define that threshold. A very high threshold will have the effect of ignoring harmonic sounds (normal notes) and a very low threshold will erroneously convert noise into pitch. We suggest starting with the slider positioned at zero. Progressively, move the slider to the right until most of the errors are eliminated. Digital Ear can send to your synthesizer the features of your voice (pitch, volume and brightness) up to 100 times per second! (i.e. every 10 milliseconds). This is user selectable. Have in mind that Digital Earrecognizes the voice features better and with fewer errors, if you decrease the time resolution. Resolution is decreased by moving the slider to the right. High-pitched voices can be tracked with more time resolution than low-pitched ones. This is the best of two worlds. Using overlapping frames virtually increases your time resolution, but without the errors that would normally be introduced. This will improve the pitch accuracy of Digital Ear especially in high frequency sounds (e.g. whistling). However, the recognition will be slightly slowed down. Clicking on the Define… icon that exists in Digital Ear settings window. A ten-octave piano keyboard will appear. Scroll through the octaves of the keyboard using the scrollbar on the bottom of the window. Note that each C key is marked with its octave number. First Click on the lowest note of your range. Then, SHIFT+Click to select the highest note. Alternatively you can set note range without going through the Digital Ear settings window. You can do that directly inside the Voice Features Display, by dragging the range handles (see figure in right). Try to move them into such a position, that the range is as "tight" as possible around your melody line. The Note Range setting is the most important parameter to be set for getting correct results. Digital Ear can send the volume events to any of the 128 MIDI controllers. On modern synthesizers this should be sent to controller #11 (expression) or controller #07 (volume). In some synthesizers, controller #11 also controls the brightness (see below) of a sound, so you may need to experiment to see which controller gives better results for you. Check this option if you want brightness events to be sent to your synthesizer. Brightness events are generated by analyzing the harmonic content of your sound. Digital Ear estimates the human perceived “brightness” of the sound and sends MIDI events to your synthesizer. Correct use of this feature can produce life-like sounding results. Use this slider to adjust the amplitude of the brightness events (depending upon the instrument's characteristics). Try to exploit the full dynamic range, avoiding clipping. Digital Ear can send the brightness events to any of the 128 MIDI controllers. On modern synthesizers this should be send to controller #74 (brightness controller). Otherwise, send these events to a controller that controls the filter cutoff on your synthesizer. Creative users can send brightness information to control any other parameter of the synthesizer (e.g. the output level of an FM operator). Select any of the 16 MIDI channels you want to send the events to. Just select one of the numeric BPM values frpm the dropdown list (you can directly type a value if you wish). This value must match exactly the BPM of your original recording (.wav file), especially if you plan to mix this track with other MIDI tracks. Selecting [ SMPTE ] will produce a MIDI file with accurate SMPTE timing. This mode produces MIDI files measuring exactly the same duration as your original PCM recording. Some sequencers do not support SMPTE timecode in MIDI files resulting in erroneous playback. Enabling this will force Digital Ear to include BPM information inside your MIDI file. If you do not enable it, your sequencer will select a default value (typically 120 BPM) and your sequence may be played slower or faster than the original. This has no effect if [ SMPTE ] timecode is selected. Here you can select any of the 128 GM (General MIDI) voices available. Digital Ear will use your selection for MIDI output. If your synthesizer is not GM compatible, then there will be a different correspondence between the program number and the instrument's name. In this case, consult your synthesizer’s manual. Select [ None ] if you want to manually select a voice on your synthesizer. This parameter is very important. If your synthesizer is GM (General MIDI) compatible, then you do not have to make any adjustment on this value (default is +/- 12 semitones). Digital Ear will adjust automatically the pitch-bend range of your synthesizer. If your synthesizer is not GM compatible (including some cheap soundcards that claim to be GM compatible) then you have to adjust this value yourself both on your synthesizer and on Digital Ear. To do this, adjust the pitch bend controller range on your synthesizer to the maximum value (up to +/- 12 semitones) and then set Digital Ear to exactly the same value. Incorrect adjustment on this parameter can produce MIDI files that sound totally wrong. Click on the Wizard icon. Check those particular settings that you are interested in, and click OK. The Settings WizardTM will scan your wave file in order to estimate the parameters you have chosen. In some cases, it may be necessary to modify the settings that the Settings WizardTM produced in order to produce better results. This is especially true for the range setting. Digital Ear can save and load an infinite (limited only by the size of your hard disk) number of settings. With these menu items, you can save your settings to disk. Use Settings > Save As... when you want to specify a filename for your settings. Otherwise, use Settings > Save to save your settings with the current filename. Use this menu item to load settings previously stored to disk. Load defaults will initialize Digital Ear with its standard settings (factory presets). Quick Settings is a brand new feature of Digital Ear 4. It allows quick selection of common settings. (e.g. Male voice, or whistling). Do not use this feature to save some sequence-specific settings. To create your own quick settings, just save them in the inside the special folder named "Quick Settings". Next time you open Digital Ear, it will appear in the drop down list. Keeping track of numerous settings corresponding to particular Wave files or (Digital Ear files, (see this section of the manual) can be difficult after a while. Digital Ear uses a simple method to keep things tidy. We suggest leaving the default filename that Digital Ear gives to your settings and in your wave (or Digital Ear) file (e.g. Soprano.set and Soprano.wav) and Digital Ear will automatically load the right settings each time you open your wave file. There is a settings file that it is named startup.set . This file contains settings that are loaded automatically during program startup. You can save your settings over this file, so that Digital Ear is initialized automatically with your own custom settings. Use this feature with caution as Digital Ear can exhibit strange behavior with wrong settings. You can always choose Load defaults to restore Digital Ear's original settings. Wave files must be recordings of monophonic solo (one note at time, no chords) performances. Files must be relatively free of background noise. Your samples should be "dry" i.e. do not use any kind of effects such us reverb or echo as they can significantly degrade the quality of recognition. Digital Ear accepts the following Audio and Video formats (audio will be extracted from video automatically.). To start the recognition engine click on the Start! icon. Digital Ear comes with a set of powerful tools to help you process your existing pitch data. These tools can be accessed using the toolbar or using the menu items under the title Tools. This function attempts to correct most of the errors during the pitch recognition process. However, keep in mind that the corrections it makes are only estimates and not based on actually measured data. This is a brand new feature of Digital Ear 4. It is an extremely useful and easy to use correction tool. Using this tool, you can easily correct areas which contain pitch errors with just a few clicks. To use it first, click on the "Area Correct" icon. Notice that the pointer now has been transformed into a hand. Drag the mouse pointer approximately over the area where the correct pitch should exist. Digital Ear will analyze that area carefully and it will estimate instantly what the correct pitch should be. You will immediately see the corrected results on the screen! This function will quantize the tracked notes into the nearest semitone values. Use this function if your track has an instrument that cannot do pitch bend effects (e.g. a piano). If you do not want your sequence to sound artificial, you have a choice of "Soft Quantizing" your melody. Choose the amount of quantization by moving the corresponding control slider. Tip: If you have played a melody without some reference tuning tone, use In-Tune Wizard first (see below), then perform a pitch quantize. That will result a smarter quantization, minimizing unwanted oscillations between successive semitones. Suppose that you have a melody that it is taken from an instrument tuned slightly higher or lower from the center. In-Tune Wizard will analyze your data and then will transpose the whole sequence, so that it is center tuned. This function does not make any quantization to the notes. This function will transpose your whole sequence by your desired amount of semitones (up to +/- 12). You also have the option to fine-tune your melody by specifying the amount of cents (1/100 of semitone.). If you need to transpose your melody by more than one octave you can repeat this process as many times as you wish. You can slow down the whole sequence by any percentage by moving the corresponding slider. Enable/disable the Attack Detection by checking/unchecking the Smart Attack Detector checkbox. If you enable this feature, Digital Ear will recognize a note's attack even if there is no silent part between successive notes. The vertical yellow lines in the display will show you the beginning ("Note On" MIDI event) of each note. This feature is particularly effective for plucked instruments. Also using this feature will produce a MIDI file that will work better with notation software. You can have on-the-fly real-time sensitivity adjustment and see the results on screen by using the slider named "Sensitivity". Increasing sensitivity will cause more "Note on" events to be triggered. Digital Ear comes with an integrated high-quality MIDI/Wave file player. The MIDI file player is at the bottom of the window. 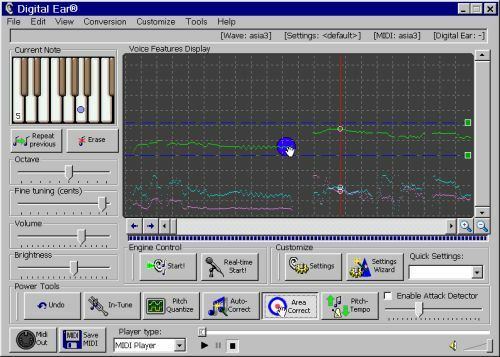 This player will play the current Wave or MIDI file. Select the appropriate file type (Wave or MIDI) by clicking in the dropdown box named: "Player type"
Digital Ear includes a powerful Voice Features Editor not found in other similar software packages. The Editor allows you to have detailed access to the slightest voice feature quickly and easily. There are no numbers to deal with, because the process is fully graphical. You can selectively view/hide any of them by using the View menu item. Each pixel in the x-axis represents a frame (the duration of a frame in milliseconds is user-defined at settings). Each pixel in the y-axis represents half semitone. Each subdivision (square box) represents one octave. You can not see all the detail in the diagram displayed. Its purpose is to give you an overview of the melodic line. In order to get more detailed information, click inside the Voice Features Display. The red vertical line is your cursor. To move the cursor slowly (a frame at time) click on the blue arrows located at the bottom left of the diagram, or use the arrow keys of your keyboard. Now you can see an expanded version of the voice features at the cursor. 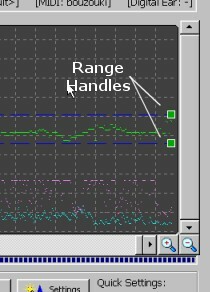 A single-octave keyboard marked with a dot that represents the current note where the cursor (red line) is. Note that the dot can move between the piano keys in order to show you the exact pitch bend (if any) of the note. The size of the dot represents to volume of the note. The color of the dot represents the brightness of the sound (the sound is brighter as the color becomes more white). Use the Magnifying Glass icons to zoom in or zoom out the voice features. Note that only the vertical axis is scaled (pitch), while the horizontal axis (time) remains the same. You can change the current note by clicking inside the keyboard and then adjusting the octave using the provided octave slider. Furthermore, you can “push” the pitch of this note higher by using the fine tuning slider. Similarly, you can change the current volume and brightness by using the respective sliders. To delete the current note click on the button "Erase" or press the key "Delete". That will produce a silence at that point and trigger a new MIDI note on the next event. The "Delete" key will also advance the cursor one frame forward. If you want to repeat the previous event (in order to correct an error) click on the icon "Repeat previous" or press the key "Insert" of your keyboard. The "Insert" key will also advance the cursor one frame forward. Note that all the changes you make are immediately reflected on the Features View Display. For your viewing convenience the current features (pitch, volume and brightness) are surrounded with a small white circle. If you make a mistake during editing or power tools processing, you can easily recover from this by clicking the undo button. You have two options. You can save your work as a MIDI file and/or as a Digital Ear file. Note: You can not open a MIDI file in Digital Ear later for editing. File > Save Digital Ear file. Digital Ear files (*.ear) always need the corresponding settings (*.set) of the wave file in order to function properly. When Digital Ear is in Real-Time mode Audio will be converted almost immediately into MIDI events. The events are send to the selected MIDI output port. It is best to use headphones, so that the output signal does not interfere with the input creating feedback effects. However it is still usable even without headphones. You have access to a real-time display that shows you the current note in a keyboard. Also there is a digital display that shows you the instantaneous frequency in Hertz as well as the closest note. MIDI Device: Make sure that you have selected the desired output device (e.g MIDI out, soundcard, or a Soft-Synth) from the drop-down list. Select audio in: It is important to select the appropriate audio recording device (your microphone) by clicking this icon. Also set up the correct input levels here. The microphone gain will give some additional amplification if your audio signal is weak. Soft Quantization, Transpose, Smart Attack Detector: These controls work similar to the corresponding non real-time power tools. LoopBe1 is an internal MIDI device for transferring MIDI data between computer programs. Basically LoopBe1 is an "invisible cable" to connect a MIDI outport of an application to any other application´s MIDI inport. All MIDI data sent to the program´s output is channeled to the receiving applications in realtime. You may connect up to 8 applications to LoopBe's inport and up to 8 applications to the outport, all sending and receiving at the same time. All this software is available free of charge in the Digital Ear website. Please refer to the manual of each software for more details. Make sure that your synthesizer is GM (General MIDI) compatible. If it is not, then you have to manually adjust the pitch bend controller range so that matches the settings on Digital Ear. See HERE the explanation of the pitch-bend settings on this manual. If your synthesizer is not XG-compatible, then you have to adjust the vibrato depth to zero. If your synthesizer conforms to the XG standard, then Digital Ear will adjust your synthesizer automatically. If you activate the “Send MIDI Volume” option then detailed volume envelope events are sent to your synthesizer. In this case it is best to use a flat envelope (i.e. organ-like) to your sounds, and Digital Earwill do the rest for you. If you do not use the Smart Attack Detector, avoid sounds that decay quickly (e.g. pizzicato style violin). You do not have to make your voice velocity sensitive. Make your voice sound best at normal velocity (MIDI value 64) . Control of the dynamic response of the sound is done by using the brightness (usually filter cutoff) and/or the volume or expression controller. If you need a reply, please include your email in your message. Information in this document is subject to change without notice and does not represent a commitment on the part of Epinoisis Software. The software described in this document is furnished under a license agreement or nondisclosure agreement. The software may be used or copied only in accordance with the terms of the agreement. It is against the law to copy this software on magnetic tape, disk, cd-rom, or any other medium for any purpose other than purchaser’s personal use. Copyright 1999-2011 © by Epinoisis Software. All rights reserved. Digital Ear® & Digital Ear Real-time® is a registered trademark of Epinoisis Software. XG® is a registered trademark of Yamaha Corporation.